Jesus of Montreal (French: Jésus de Montréal) is a 1989 French Canadian comedy-drama film written and directed by Denys Arcand, and starring Lothaire Bluteau, Catherine Wilkening and Johanne-Marie Tremblay. The film tells the story of a group of actors in Montreal who perform a Passion play in a Quebec church (the film uses the grounds of St Joseph's Oratory on Mount Royal), combining religious belief with unconventional theories on a historical Jesus. As the church turns against the main actor and author of the play, his life increasingly mirrors the story of Jesus, and the film adapts numerous stories from the New Testament. In Montreal, an unknown actor named Daniel is hired by a Roman Catholic site of pilgrimage ("le sanctuaire") to present a Passion play in its gardens. The priest, Father Leclerc, asks him to "modernize" the classic play the church has been using, which he considers dated. Despite working with material others consider to be clichéd, Daniel is inspired and carries out intensive academic research, consulting archaeology to check the historicity of Jesus and drawing on supposed information on Jesus in the Talmud, using the Talmud name Yeshua Ben Pantera for Jesus, whom he portrays. He also includes arguments that the biological father of Jesus was a Roman soldier who left Palestine shortly after impregnating the unwed Mary. He assembles his cast, found from insignificant and disreputable backgrounds, and moves in with two of them, Constance and Mireille. When the play is performed, it receives excellent reviews from critics but is regarded as unconventional and controversial by Father Leclerc, who angrily distances himself from Daniel. Daniel's life is further complicated when he attends one of Mireille's auditions. Mireille is told to remove her top, causing an outburst from Daniel in which he damages lights and cameras, resulting in him facing criminal charges. When the higher authorities of the Roman Catholic Church strongly object to his Biblical interpretation and security forcibly stops a performance, the audience and actors object and he is injured in an ensuing accident. He is first taken by ambulance to a Catholic hospital where is neglected. He leaves and collapses on a Montreal Metro platform. The same ambulance takes him to the Jewish General Hospital. Despite immediate, skilled, and energetic efforts by the doctors and nurses, he is pronounced brain-dead. His doctor asks for the consent of his friends, since he has no known relatives, to take his organs for donation. His physician states that they would have been able to save him if he had been brought to them half an hour earlier. In the wake of his death, his friends start a theatre company to carry on his work. Christ Driving the Money Changers from the Temple by El Greco, a Biblical scene represented in Jesus of Montreal's symbolism. Authors have written Jesus of Montreal has "many parallels" to the New Testament, and "is so loaded with all sorts of fascinating allusions" between modern Quebec and the Gospels. Daniel is mainly known to the public through "hearsay", and is reported to have traveled to India and Tibet, reflecting "extra-biblical legends" about Jesus. The story begins when Daniel becomes a teacher to his actors, as Jesus was to his disciples. Another actor named Pascal Berger, played by Cédric Noël, praises Daniel as John the Baptist hailed Jesus. Pascal "loses his head" when an advertiser uses his photo to sell perfume, just as John the Baptist was beheaded. Daniel's outburst in the audition scene evokes the Cleansing of the Temple. In the subsequent criminal case, Daniel has a Pontius Pilate-like judge played by Arcand, and meets a lawyer played by Yves Jacques who - looking out over the city from a skyscraper - offers Daniel profit and fame, telling him "The city is yours," which is a reference to the Temptation of Christ. After he is injured, Daniel is taken to the Jewish General Hospital. Arcand said this is a deliberate parallel with Jesus being a Jew "rejected by his own people," but Arcand depicted the hospital as efficient and better organized than other Montreal hospitals because he felt this was accurate. Scholar Jeremy Cohen tied the Jewish doctor's statement "we lost him" to the idea of Jewish deicide. At the end, Daniel's organs are donated to patients, equated to the Resurrection of Jesus. Daniel's "disciples" also continue his work after he dies, led by Martin, played by Rémy Girard, who is an analogue of Saint Peter. 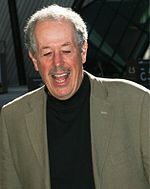 Director Denys Arcand conceived of the story for Jesus of Montreal after meeting an actor playing Jesus, and wrote the screenplay. The idea for the film came to director Denys Arcand after an actor apologized for appearing with a beard at an audition at a Montreal conservatory, saying "I'm sorry, I'm Jesus." The actor explained that he had the role of Jesus in a passion play at Saint Joseph's Oratory. Arcand went to see the play and recalls, "I saw actors in a mediocre production which received shouted applause from the tourists. I decided I had to make a film." The actor also spoke to Arcand about the difficulties he and his friends had in the acting profession, taking undesirable roles in TV advertisements and pornographic films. As a lapsed Catholic and self-proclaimed atheist, Arcand did not envision Jesus of Montreal as a religious film, adding, "In my film, the story of the Passion is a metaphor of an artist and his struggles and temptations." He spent a year in 1987 writing the screenplay. The film was made on a budget of $4.2 million, with Arcand saying he got a "blank check" after his success with The Decline of the American Empire (1986). This budget was unusually large for a Quebec film. Arcand saw actress Johanne-Marie Tremblay in Straight for the Heart (1988) and cast her as Constance, one of Daniel's actresses who takes him in to live with her. She reprised her role as Constance in Arcand's later films The Barbarian Invasions (2003) and Days of Darkness (2007). Robert Lepage, who played René, one of Daniel's "disciples", was a playwright and said that aside from TV and student films, Jesus of Montreal was his first major acting role. He said that the screenplay was complete and detailed, leaving less room for improvisation than he expected. Saint Joseph's Oratory did not grant permission for the film to be shot inside, though some of the film was shot near it. The film was shot with mobile cameras on location in Montreal, which has many churches against its skyline and has been "a center of Catholicism since its beginnings". Arcand stated he often shot Montreal from a distance or from the air to represent God viewing the city. He claimed that while French Canadian churches in Montreal denied permission to shoot inside their buildings, an English language Catholic church allowed the crew to use its space. He said this was because, although church members asked to see the screenplay, they could not read French and needed money from the rental. Some scenes were shot near Saint Joseph's Oratory. A substantial amount of theatrical blood was required for the Passion play scenes. According to Box Office Mojo, the film grossed $1,601,612 in North America after closing on 15 November 1990. In Canada, it won the Golden Reel Award, indicating the highest box-office performance of any Canadian film that year. Film scholar Marc Gervais described it as "a great box office hit in Canada." In English Canada, it was among only three Canadian films to gross over $500,000 between 1987 and 1990, along with Black Robe and Dead Ringers. Jesus of Montreal did not enjoy the degree of success in France as Arcand's prior The Decline of the American Empire (1986), drawing an audience of 187,827 people, the eighth highest for a Quebec film to date. Generally, the film did not meet expectations in drawing audiences in countries with predominantly Roman Catholic populations, with Arcand claiming using the name Jesus in the title made the subject matter appear cliché. In the U.S., Stephen J. Nichols referred to it as "not-very-popular" and said it was Martin Scorsese's The Last Temptation of Christ "to dominate the 1980s" in dramatic portrayals of Jesus. Lothaire Bluteau received positive reviews for his performance in the film and won the Genie Award for Best Actor. Jesus of Montreal enjoyed positive reviews, with a 79% approval rating on Rotten Tomatoes. Roger Ebert gave the film three and a half stars, calling Arcand "the best of the new generation of Quebec filmmakers", and saying "It's interesting the way Arcand makes this work as theology and drama at the same time", adding Lothaire Bluteau is perfectly cast. Caryn James of The New York Times called the film "intelligent" and "audacious", particularly praising the first half "before it gives in to leaden, self-conscious Christ imagery". Peter Travers of Rolling Stone wrote "Arcand has exposed a world that can't recognize its own hypocrisy or hear a voice in the wilderness". Jonathan Rosenbaum called it a "must-see". David Denby of New York felt Jesus of Montreal was "smug from the beginning", but the film was not boring thanks to Arcand's "theatricality and skill". Entertainment Weekly gave the film a C-, questioning the controversy depicted in the film, saying "Hasn’t Canada, in the past 20 years, ever seen a single touring company of Jesus Christ, Superstar?" and claiming the film "flits between the smug and the ersatz mystical". Hal Hinson of The Washington Post said the scenes where Daniel collects his actors are the best part of the film, but the rest is outdated. In terms of religious response, Jesus of Montreal met "dead calm" on its release, in contrast to Scorsese's more controversial The Last Temptation of Christ. Critics in the Toronto International Film Festival ranked the film second in the Top 10 Canadian Films of All Time in 1993 and 2004 and fourth in 2015. In 2003, Rob Mackie of The Guardian called the film "thought-provoking and wickedly funny" and said "Lothaire Bluteau, makes a charismatic focus whose performance makes sense of the whole thing". In 2010, British critic Mark Kermode named Bluteau as one of "The 10 best screen faces of Jesus," calling him "mesmerising" and praising the film as a "genuine masterpiece" and "real cinematic miracle". In 2014, Marc-Andre Lussier of the Montreal-based La Presse called the film excellent. E! Online named it the third best "Jesus-inspired" film, calling it "beautiful" and "inventive". Jesus of Montreal won the Prize of the Ecumenical Jury at the 1989 Cannes Film Festival and swept the 11th Genie Awards, winning 12 prizes, including Best Motion Picture, Best Director for Arcand, and the Golden Reel Award. It was also nominated for the 1989 Academy Award for Best Foreign Language Film. ^ a b c d Rosenthal, Donna (22 July 1990). "THE PASSION OF DENYS ARCAND". The Washington Post. Retrieved 4 August 2016. ^ a b "Jesus of Montreal". Box Office Mojo. Retrieved 5 August 2016. ^ Malone 2012, pp. 119-120. ^ Schaberg 2004, p. 115. ^ a b Pallister 1995, p. 383. ^ Beckwith 2003, p. 174. ^ Reinhartz 2007, p. 155. ^ a b O'Brien, Tom (Autumn 1990). "Jesus of Montreal (Jésus de Montréal) by Denys Arcand". Film Quarterly. 44 (1): 47. ^ a b Stern 1999, p. 331. ^ a b Reinhartz 2013, p. 149. ^ a b Denby, David (4 June 1990). "An Actor Died for Your Sins". New York. p. 76. ^ a b Stern 1999, p. 330. ^ Reinhartz 2013, p. 148. ^ Reinhartz 2007, p. 32. ^ a b Ebert, Roger (18 July 1990). "Jesus of Montreal". Rogerebert.com. Retrieved 4 August 2016. ^ a b May 2000, p. 69. ^ Alemany-Galway 2002, p. 122. ^ Simons 2004, p. 162. ^ Cohen 2007, p. 247. ^ Reinhartz 2007, p. 37. ^ a b c Thomas, Kevin (29 May 1990). "Canadian Director Tries Loftier Topic After 'Decline': Movies: Denys Arcand wins praise and a prize at Cannes for 'Jesus de Montreal.'". Los Angeles Times. Retrieved 4 August 2016. ^ Chan, Wah Keung; Liganor, Lilian I. (16 December 2007). "Réflexions Denys Arcand". La Scena musicale (Montréal). 5 (4): 25. ^ Melnyk 2004, p. 141. ^ a b Dunđerović 2003, p. 150. ^ "Johanne Marie Tremblay". Radio-Canada. Archived from the original on 11 September 2016. Retrieved 28 August 2016. ^ Pike 2012, p. 105. ^ Alemany-Galway 2002, p. 134. ^ Simons 2004, p. 159. ^ Bouchard 2011, p. 255. ^ Dundjerovic, Aleksandar Sasha (2005–2006). "Contradictions and Paradoxes in Denys Arcand's The Barbarian Invasion". London Journal of Canadian Studies 21: 3. ^ Gervais 2007, p. 174. ^ Dorland 1996, p. 150. ^ Demers, Maxime (26 November 2014). "Jésus de Montréal présenté à Paris". Le Journal de Montréal. Retrieved 5 August 2016. ^ Marshall 2001, p. 85. ^ Curtin, John (20 May 1990). "Denys Arcand Offers a 'Jesus' for the 1990's". The New York Times. Retrieved 5 August 2016. ^ Nichols 2008, p. 206. ^ "JÉSUS DE MONTRÉAL (JESUS OF MONTREAL) (1989)". Rotten Tomatoes. Retrieved 4 August 2016. ^ James, Caryn (25 May 1990). "A Modern Passion Play In Montreal". The New York Times. Retrieved 4 August 2016. ^ Travers, Peter (25 May 1990). "Jesus of Montreal". Rolling Stone. Retrieved 4 August 2016. ^ Rosenbaum, Jonathan (20 July 1990). "Modern Messiah JESUS OF MONTREAL". Chicago Reader. Retrieved 7 August 2016. ^ Denby, David (4 June 1990). "An Actor Died for Your Sins". New York. p. 75. ^ "Jesus of Montreal". Entertainment Weekly. 1 June 1990. Retrieved 5 August 2016. ^ Hinson, Hal (20 July 1990). "Jesus of Montreal". The Washington Post. Retrieved 5 August 2016. ^ Barsanti 2011, p. 88. ^ "Top 10 Canadian Films of All Time". The Canadian Encyclopedia. Retrieved 4 August 2016. ^ Mackie, Rob (22 August 2003). "Jesus of Montreal". The Guardian. Retrieved 4 August 2016. ^ Kermode, Mark (28 March 2010). "The 10 best screen faces of Jesus". The Guardian. Retrieved 5 August 2016. ^ Lussier, Marc-Andre (29 November 2014). "Jésus de Montréal ressuscité à Paris". La Presse. Retrieved 5 August 2016. ^ "Top 10 Jesus-Inspired Movies". E! Online. Retrieved 4 August 2016. ^ a b "Festival de Cannes: Jesus of Montreal". festival-cannes.com. Archived from the original on 8 February 2012. Retrieved 1 August 2009. ^ "On his way to victory". Toronto Public Library. 20 March 1990. Retrieved 5 August 2016. ^ a b "The 62nd Academy Awards (1990) Nominees and Winners". oscars.org. Retrieved 6 September 2015. ^ "Film Not in the English Language in 1991". British Academy of Film and Television Arts. Retrieved 5 August 2016. ^ "Jésus de Montréal (Jesus of Montreal)". The Canadian Encyclopedia. Retrieved 4 August 2016. ^ "Jesus of Montreal". Golden Globe Awards. Retrieved 4 August 2016. ^ "1990 Award Winners". National Board of Review. Retrieved 7 August 2016. ^ Hartl, John (19 June 1990). "Teen film is surprise Best Picture winner at Seattle Film Festival". The Spokesman-Review. p. F5. ^ "Film and Video Awards: Toronto International Film Festival". Berkeley Library University of California. Retrieved 4 August 2016. Alemany-Galway, Mary (2002). A Postmodern Cinema: The Voice of the Other in Canadian Film. Lanham, Maryland and London: The Scarecrow Press. ISBN 0810840987. Barsanti, Chris (2011). Filmology: A Movie-a-Day Guide to the Movies You Need to Know. Adams Media. Beavis, Mary Ann (2011). "Jesus of Canada? Four Canadian Constructions of the Christ Figure". In Ellen M. Leonard; Kate Merriman. From Logos to Christos: Essays on Christology in Honour of Joanne McWilliam. Wilfrid Laurier University Press. ISBN 155458728X. Beckwith, Sarah (2003). Signifying God: Social Relation and Symbolic Act in the York Corpus Christi Plays. University of Chicago Press. ISBN 0226041336. Bouchard, Larry D. (2011). Theater and Integrity. Evanston, Illinois: Northwestern University Press. ISBN 0810125625. Cohen, Jeremy (2007). Christ Killers: The Jews and the Passion from the Bible to the Big Screen. Oxford and New York: Oxford University Press. ISBN 0195178416. Dorland, Michael, ed. (1996). The Cultural Industries in Canada: Problems, Policies and Prospects. Toronto: James Lorimer & Company, Publishers. ISBN 1550284940. Dunđerović, Aleksandar (2003). The Cinema of Robert Lepage: The Poetics of Memory. London and New York: Wallflower Press. ISBN 1903364337. Gaudreault, André (2016). "The Passion of Christ". The Silents of Jesus in the Cinema (1897–1927). New York and London: Routledge. ISBN 1317806735. Gervais, Marc (2007). "Jésus de Montréal: The Vision of Denys Arcand". In Malone, Peter. Through a Catholic Lens: Religious Perspectives of 19 Film Directors from Around the World. A Sheed & Ward Book. ISBN 1461718783. Gray, Jeremy. Lonely Planet Montreal. Melbourne, Oakland, London and Paris: Lonely Planet Publications. ISBN 1741041090. Malone, Peter (2012). Screen Jesus: Portrayals of Christ in Television and Film. Lanham, Toronto and Plymouth: Scarecrow Press. ISBN 0810883902. Marshall, Bill (2001). Quebec National Cinema. Montreal and Kingston: McGill-Queen's University Press. ISBN 077352116X. May, John R. (2000). New Image of Religious Film. Franklin, Wisconsin: Sheed & Ward. ISBN 1556127618. Melnyk, George (2004). One Hundred Years of Canadian Cinema. Toronto, Buffalo and London: University of Toronto Press. ISBN 0802084443. Nichols, Stephen J. (2008). Jesus Made in America. InterVarsity Press. Pallister, Janis L. (1995). The Cinema of Québec: Masters in Their Own House. Associated University Presses. ISBN 0838635628. Pike, David Lawrence (2012). Canadian Cinema Since the 1980s: At the Heart of the World. Toronto, Buffalo and London: University of Toronto Press. ISBN 1442698322. Reinhartz, Adele (2013). Bible and Cinema: Fifty Key Films. London and New York: Routledge. ISBN 0415677203. Reinhartz, Adele (2007). Jesus of Hollywood. Oxford University Press. Schaberg, Jane (2004). The Resurrection of Mary Magdalene: Legends, Apocrypha, and the Christian Testament. Bloomsbury Publishing USA. ISBN 1441141758. Simons, Tony (2004). "Denys Arcand: Jésus de Montréal". Where are the Voices Coming From? : Canadian Culture and the Legacies of History. Amsterdam and New York: Rodopi. ISBN 904201623X. Stern, Richard C.; Jefford, Clayton N.; DeBona, Guerric (1999). Savior on the Silver Screen. New York: Paulist Press. ISBN 0809138557.